by Addison Fox, Tyler Anne Snell, Webb D./Black R.
It isn't easy for quiet accountant Bellamy Reeves to open herself to trust, but she might have to make an exception for K-9 bomb squad officer Donovan Colton and his adorable dog when her life threatens to explode—literally. It's bad enough for security expert to be threatened over gold stolen during his unit's last mission in Iraq—a theft of which he's innocent. But to make matters worse, reporter Rebecca Wallace comes in harm's way while investigating him. Can he keep her safe and maintain his innocence in the line of fire? 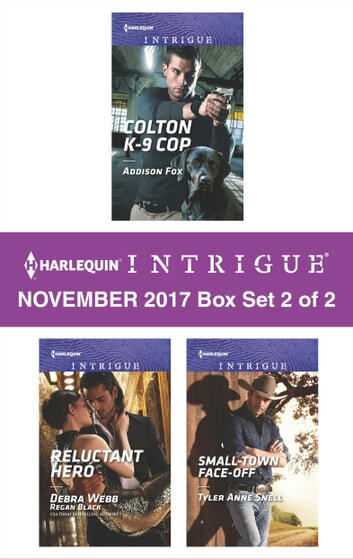 Look for Harlequin Intrigue's November 2017 Box Set 1 of 2, filled with even more edge-of-your seat romantic suspense! by Addison Fox,Tyler Anne Snell,Webb D./Black R.